The Story So Far… » Blog Archive » So You Think You’re Going Somewhere Do You…? So You Think You’re Going Somewhere Do You…? She’s one of the neighborhood feral cats…a beautiful little calico I’d take into my home in a heartbeat but of course she won’t let anyone near. Her pelt is always well kept and shiny so either someone in the neighborhood is feeding her or she’s making a good living on the local rodents…and er…birds. This is why I keep my feeders out of reach of little calico cats. Also one ear has been clipped which means someone took her to the vet to be spayed and given her shots. 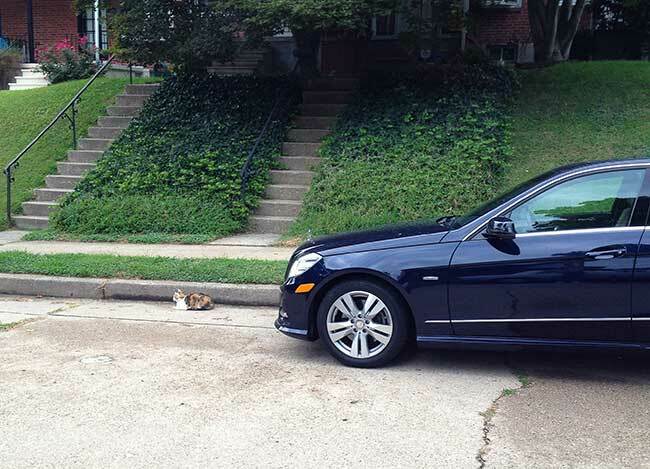 She likes to nap under my car, where she can keep an eye on my bird feeders. Normally she walks off when I get in the car but that time she just stayed put and I just waited her out. I was in no big hurry. She did this little indifferent cat stroll away from the car when I came down to it…parked herself a short distance away, made a big deal out of grooming herself, stretch, walk a little way further down the road, repeat… I’d have a cat of my own in the house but I am single and often away and there is no one I know here in Baltimore I’d give the key to so they could look in on a pet while I was gone. My life here is more solitary then her’s, and I will not bring a pet into the house just so it can be alone most of the time. They say cats are fine with being alone but I think no animal, bird or mammal, can be alone for too long. A pet needs a better home then I can give it. She is waiting for you to TIP her! 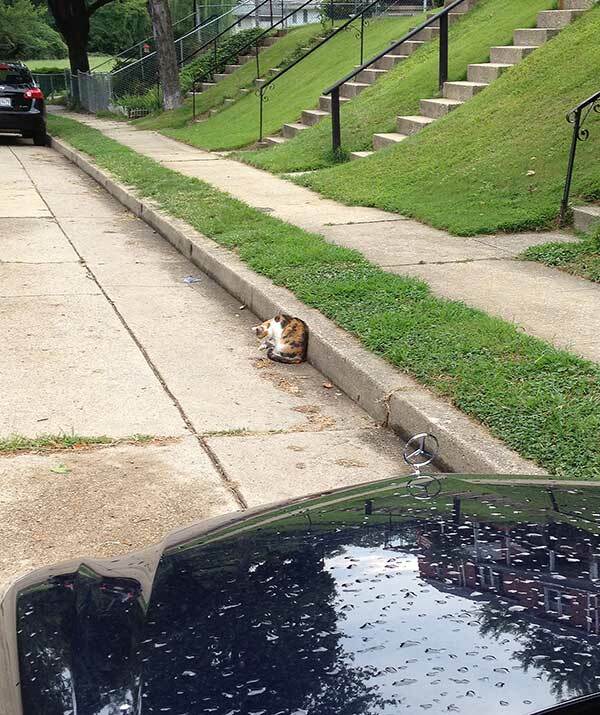 I read that the city of Baltimore has stopped using “The boot” for parking violators, but instead has hired homeless cats to block cars until they pay their fines. Unfortunately, some of them have started to shake down other people. My best advice to you is to just tip her and be on your way. In related news: It has long been rumored that John Ashcroft is mortally terrified of calico cats. Be nice if we could hire a pack of them to watch the neighborhood cars for smash and grab thieves.Â The city rats aren’t much help.